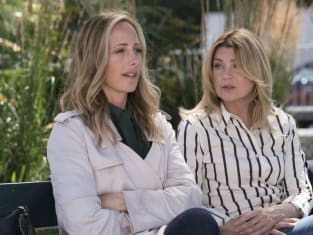 There were some fun new dynamics on Grey's Anatomy Season 15 Episode 5. Also, after an in-depth talk with Meredith, Teddy made the decision to tell Owen the truth about her pregnancy. Meanwhile, Amelia and Owen spent the day posted outside of Betty's school to make sure she didn't get into trouble. Join TV Fanatics Rachelle Lewis, Stacy Glanzman, and Kim Russell as they discuss the hour. Teddy explained why she was holding off on telling Owen the truth. What are your thoughts on her reasoning? Rachelle: I agree with her reasoning. She loves him plain and simple. Teddy didn’t want to mess up the happiness Owen has found. I do think she is correct in the sense that Owen can’t be alone. He does go from woman to woman. I felt for her as she was explaining herself to Meredith. She is alone, confused and pregnant. That being said it is time for her to tell him. The secret needs to come out. Thankfully, the previews for next week’s episode make it look like Teddy is going to tell Owen. I hope that is not a big tease. Stacy: I can understand where her head was at, but I think if she had really thought it through, she would have realized that telling him was the right thing to do. Sparing his feelings now will only lead to more pain later. If Owen found out on his own years later, he would be so hurt that she didn't tell him. Romantic feelings aside, these two are supposed to be best friends. He would be devastated if she kept his baby away from him. Kim: She loves Owen and wants him to love her for her. I get it, and it's valid, but she is where she is. She's scared, but she's going to have to take the leap. If Owen is half the man she believes he is (and he is), he will be there for her and their baby. She has to trust him and trust that she's been right about him since day one. Which dynamic did you enjoy the most: Bailey and Jo, Teddy and Mer, Webber and DeLuca, or Link and Alex? Rachelle: Teddy and Meredith all the way. I enjoyed not only these two women bonding and supporting each other but also a storyline outside the hospital. They were also hilarious together. Yes, the two ladies were having a serious discussion, but between the cooking and Teddy’s anger, there were several funny moments. Stacy: Alex and Link for me, mostly because I was so relieved they didn't go down the jealousy path with Alex again. Been there, done that. When they revealed the real reason why Alex was angry, it made total sense. Both Link and Jo stated they had a sibling type relationship, and in Alex's mind, Link didn't behave like a brother should when his sister is in trouble. That whole moment when Link explained that he didn't know the extent of it and that he absolutely would have leveled the guy if he did was all Alex needed to hear to accept him. I think Alex wishes he had been in Jo's life back then and could have done something to prevent all that pain. Kim: I enjoyed Teddy and Mer. They haven't really spent a whole lot of time together before. Teddy needed an ear and Mer needed help in the kitchen. Meredith is full of good advice. She's been around the block or two and is not one to mince words. I liked their conversation and hope we get to see more of the two. Jackson returned and apologized to Maggie for leaving. React. Rachelle: Maggie forgave him too quickly. Jackson just left without talking to her. I know he was texting her on the road, but it is not the same. I think he needed to do more to show Maggie he was sorry. It wasn’t like he came back for Maggie. He came back for a surgery. Stacy: She forgave him way too quickly. It still bothers me that he couldn't go talk to her in person and explain that he needed some time to find himself. One conversation to show the woman you supposedly love some respect, rather than bailing on her after a voicemail and a few texts. It's not OK, and she has no guarantee he won't do it again. As Rachelle said, he didn't even come back for her. I think Maggie should make him work a little harder to earn her trust back, but now that she has forgiven him, he better not lose it again. Kim: Maggie's a forgiving person, and Jackson's never done anything like this before. I say he gets a pass this time around. If he does it again, though, that's going to be a problem. Amelia was finally able to talk about Christopher, and with Owen at that. Are you happy with where Amelia is with pseudo-motherhood and her relationship with Owen? Rachelle: Yes, I am so happy with where Amelia is right now in both her acting mother role and acting wife role. She is truly happy, and that is not something fans have ever truly seen with Amelia. My heart melted when she opened up to Owen about Christopher. He is the one person she can trust with her feelings, especially when it comes to her son. Amelia is finally coming to terms with what she really wants, which I think has always been a family. I hope she doesn’t become closed off again when she finds out Teddy is pregnant. I would like to see her stand by Owen for once instead of running away. I do think she is capable of that now. Stacy: I like happy, well-adjusted Amelia. I've never been a huge fan of the character, but this is definitely the best version of her. Talking about Christopher was a huge step for her, and it proved that she's found a good place in her life. I hope Teddy doesn't ruin it, and they all find a way to make this crazy situation work. The last thing I want to see is Amelia on another downward spiral when she's finally found some happiness and stability. Kim: I'm happy for Amelia, and this is just one more step on her road of recovery. It's healthy for her to talk about Christopher and is essential to her healing from her past. I was glad she trusted Owen enough to open up, although it probably would've been better pre-divorce and pre-Teddy, but hey, it's a drama, so what are you gonna do? I think Amelia has come so far, and I'm worried about what's going to happen to her stability and her and Owen's relationship once Teddy reveals her pregnancy. Rachelle: Every scene with Amelia and Owen in the car outside Betty’s school. They were hysterical and typical parents. The best was when the vice principal had to come out and tell them he was getting calls about them. Owen and Amelia were such parents; it was great. Plus, they talked the whole time and talking was not always their specialty. I also liked how instead of getting mad at them, Betty made a wise-crack about Owen’s dad jeans. I felt it was her way of appreciating that they cared, but since she is a teenager, she obviously can’t say she cares. Stacy: I loved Bailey putting that patient in her place by stating that she was the one who trained Meredith Grey. Meredith is a rock star, but so is Bailey. Meredith wouldn't be the doctor she is without Bailey as her teacher. Kim: I loved the scene with Owen and Amelia when she opened up to him. The way he was watching her with the baby was so sweet, and I am really digging them as an odd little family. I know it's about to get shaken up, so I just want to revel in the adorableness while I can. It's your turn, Grey's Fanatics! Do you agree with us? Hit the comments below with your thoughts. 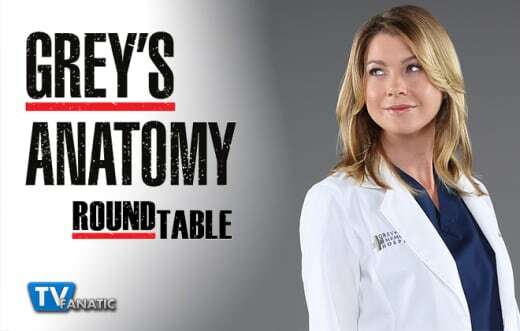 Grey's Anatomy airs Thursdays on ABC!